Colour: intense red with purple tints. Nose: fragrances of red fruit with notes of blackberries, blackcurrants and cherries. Palate: rich, subtle and elegant. This wine remains supple and easy-to-drink. Food pairing: pairs perfectly with lamb, game and meat in a sauce or stew. Grenache, Syrah and Rolle (Vermentino). Colour: lovely pale and crystalline appearance with bright, clear colour tones. Nose: reveals red fruit with notes of white flowers, strawberry, peach, grapefruit and hawthorn. Palate: fresh, smooth and ethereal structure, with a deliciously fruity strawberry flavour on the finish. 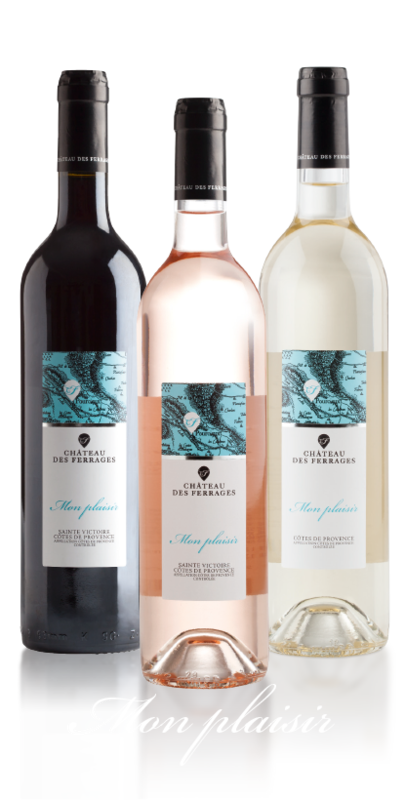 Food pairing: this rosé will pair well with all refined, spicy dishes, as well as white meat, poultry and fish (grilled or in a creamy sauce). Colour: bright, shimmering, elegant pale yellow appearance set off by tints of green. Nose: shows a fresh spring character with notes of citrus, grapefruit, hawthorn and pineapple. Palate: fresh with flavours of flowers and exotic fruits, revealing a wine which is both floral and mineral. Food pairing: this wine is the perfect companion to shellfish and grilled fish (such as sea bream and sea bass).